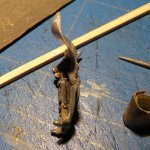 The general idea is to choose a miniature with extensive areas of metal, does not matter if its only chainmail and greaves (like any of the rohirrim or this lr17) or full plate armour (like m271), and neither it matters if it's alignment is for the "light" side or the "dark" side. 1. Please keep this thread to post pictures, comments and questions about the miniatures being painted and the work that participants do around them. 4. A new voting poll thread will be opened with all the "final picture" from all participants once the end date approaches. We will put a link to it here for easy access. 5. This time mounted (horse, pony, monster.. etc...) references are not allowed, with the unique intention of unifying criteria for selecting which miniature reference we all should paint. 6. 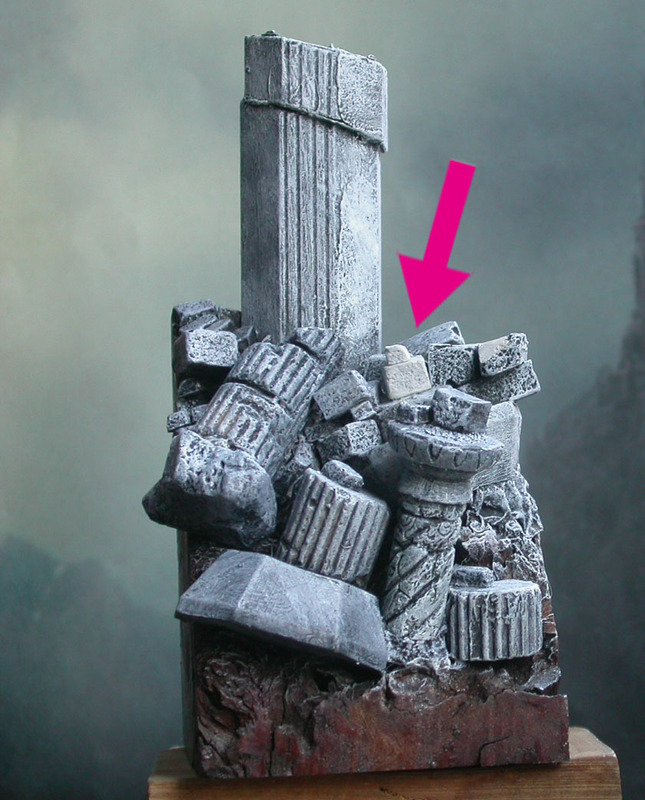 Participation is opened to all mmp members until the 2nd of February, but the idea is to share our painting/modelling/whatever processes so we ask for an initial image of the miniature, a photo finish, but also at least another one that shows an intermediate stage of the miniature. 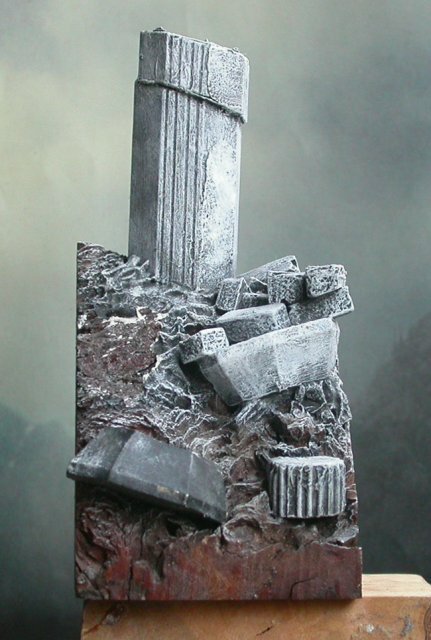 Is Isildur basecoated in that shiny mithril basecoat? Will it give problems? Seems that you will need to run a little.... Anyways if you wont have a painting block or a real life issue, it should be time enough.  Wishing you a nice inspiration as I like this mini a lot. The base coat is slightly shiny, I'm not sure if I have actually painted any of those really shiny base-coated figures so I will have to see . I can always give it a light coat of another primer. 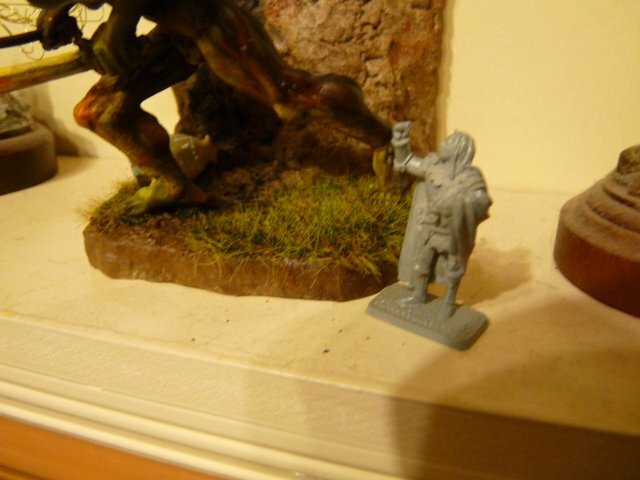 Oh, my Isildur-figure also has that unpleasant primer. I also witnessed the same bad primer on other MS-figures. But the company still seems to have some primer-problems from time to time. That is quite annoying if you consider the price of the figures. . . .and a lot of little stones on the base too. 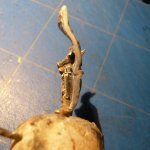 Well- as I write in privte to somebody else here inside this forum there are 11 projects on my workbench at present. ONE of them is the painter´s league No. two . . . so hold on to some pics in the very close future . . .
Mmmm I like having news from Germany like these. This makes me thirsty. Master Thingol ? may I request your choice ? So- I can provide first results concerning the base. It is a long-time-ago-started-base. I decide to expand the long-time-ago built base a little bit. 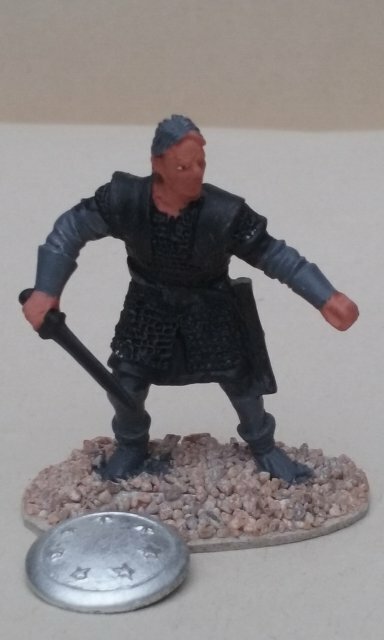 As I pointed out some weeks before, it is somekind of a re-paint and paint-project of one of the first figures I painted using oil colours. That was somewhere in 2004. I never finished this miniature. 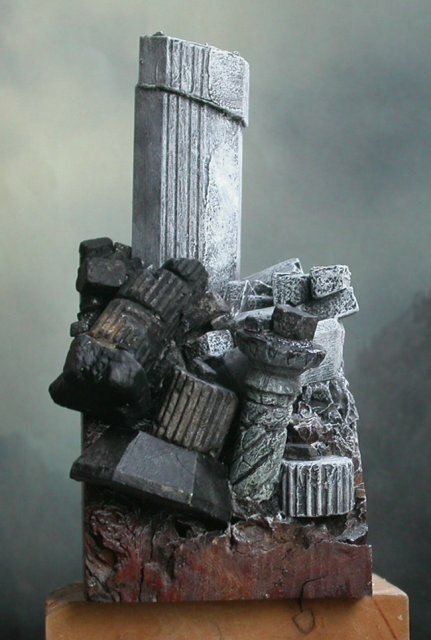 The idea was a scenery which shows parts of the demolished bridge over the river Narog after Glaurung´s destruction. 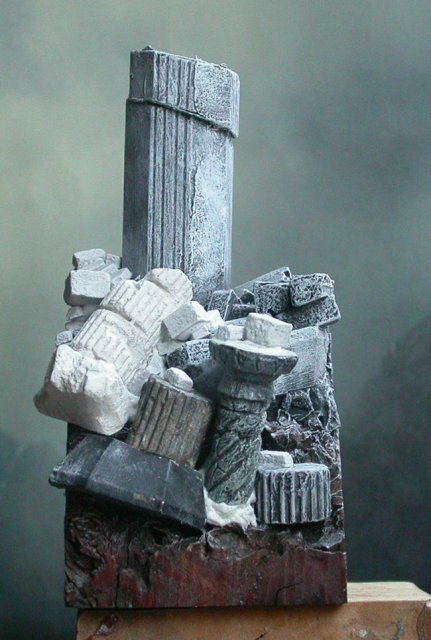 As you see I add some more stones and columns parts. 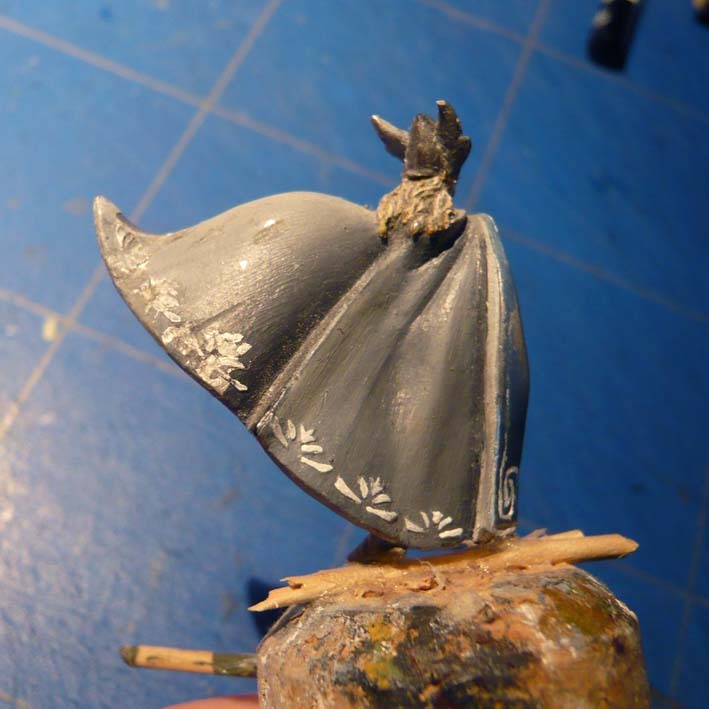 Everything is primed with a layer of black oil colour. Over Christmas days there is time for drying befor I start to weather the parts with grey and white tones . . . Very promising indeed. I recognise also the old project. Great to see it today. 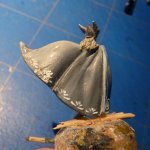 Master Thingol, I was wondering which mini you will choose for painting challenge. This pictures shows the first layer of white oil colour. Everything has to dry again for starting the second- maybe the last- layer. Unfortunately I forgot two stones !!!!!!! So I have to start the whole process for those again . . .
More very soon . . .
Ah, it must be a relief! 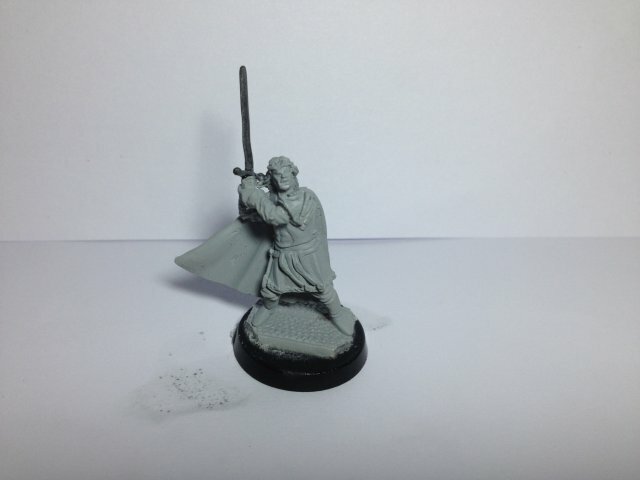 Great Master Turambar I cant wait to see finished your miniature!!! I can tell you something. In this case, how I spent the Christmas days . . . The coat. Never saw such a "fat" coat before. so- I decided to starting to "thinner" that coat that way, that it looks the right way. So I began grinding and sanding and grinding and sanding and grinding and sanding and grinding and sanding . . . Very toilsome indeed. Furtheron I flex the pattern off and do the same grinding and sanding work at the backside. Meanwhiling the two stones had become their first white layer and the figure itself is already "on the cork" ready for some (new) paint. 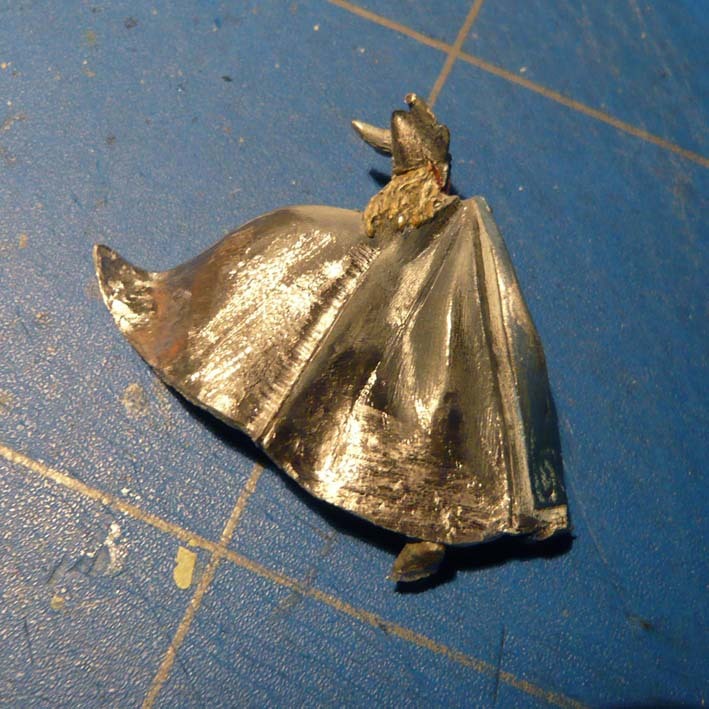 Wow, thinner coat, better rendering for sure ! very impressive Master Archer. And this is also a reminder for all: A little less than a month to finish up our entries!! I started this week-end. Only 1st layer is done so far, not very interresting ... I shall have more to show next week.